Commercial fishing along Lake Superior’s North Shore first began in 1834, when the American Fur Company set up fisheries on Encampment Island, Grand Portage, and Isle Royale. In 1839 they caught five thousand barrels of fish, but had no market for sales. The operation closed in 1842. Ojibwe Indians continued to harvest fish at Fond du Lac, hauling in record numbers of walleye from the St. Louis River rapids for three weeks each spring. Reports stated that in 1853 two fishermen with one net filled a two-fathom canoe in less than an hour. In 1860, Reverend James Peet of Oneota wrote that he had helped pull in a seine holding 523 walleye. He also reported that a commercial fisherman named Harrington had caught over fifteen thousand fish and that “Mr. Barlow’s party have caught over thirty barrels” at roughly ninety fish per barrel. Up the lake’s north shore, H. H. McCullough sold fish caught by Ojibwe at Grand Portage. No one found great success: there was still relatively no local market nor an efficient way to bring fish to customers. The industry remained nearly dormant in Duluth until the 1870 arrival of the Lake Superior & Mississippi Railroad: fisheries could now ship their product to distant markets. Scandinavian immigrants who had previously made their living fishing homeland waters also began arriving in the 1870s. Fisheries popped up in settlements along the western Lake Superior shores at Isle Royale, and the Apostle Islands, harvesting chubs, yellow perch, sturgeon, lake trout, and herring and whitefish by the ton. In 1871 Duluth pioneers Jerome Cooley and George Lavaque established the Cooley-Lavaque Fishery at 437 Lake Avenue and 14 Morse Street in today’s Canal Park Business District. A. Booth and Sons Packing Company of Chicago, wholesale dealers in fish, purchased Cooley-Lavaque in 1886. A. Booth and other fisheries found markets for their yield in Minneapolis, St. Paul, Chicago, Kansas City, and St. Louis. A. Booth also recruited fisherman from Norway and Sweden to immigrate to the United States and establish fishing villages along western Lake Superior’s north and south shore and at Isle Royale. Booth quickly became western Lake Superior’s dominant fishery. In 1909, 1912, and 1915 the company enlarged or built new cold storage buildings for its fishery. Herring fishing reached its peak in the early 1890s, providing 78 percent of herring caught in the United States. 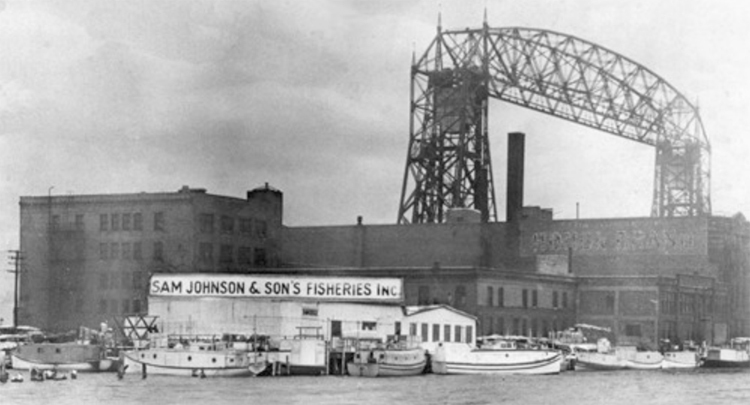 In 1897 Sam Johnson, a Swedish immigrant who learned to fish on the Baltic, founded Sam Johnson & Sons Fisheries Inc. directly across the street from Booth Fisheries. Other Duluth fisheries active at the time included H. Christianson & Sons, Hogstad Fisheries, Scandia Fish Company, Bray Fish Company, Goldish Fisheries, A. Kemp Fisheries, and Sivertson Brothers. In 1892 Severin Sivertson and his two brothers emigrated from Norway and settled along the North Shore. He soon joined the fishing communities on Isle Royale. Sivertson Brothers Fisheries was established in Duluth in 1921 to “extend the markets for the catch of the Isle Royale and North Shore fishermen.” Fishing villages were also established on the south shore at Port Wing, Cornucopia, and other Wisconsin communities. The industry continued to thrive. Outfits like A. Booth supported their fisherman by sending steamers, including the America to supply the villages, allowing mostly Norwegian (with some Finnish and Swedish) fisherman to spend more time working the waters. The industry reached its peak in 1915 with a record catch of 20 million pounds in Duluth alone. In the 1920s, more than two hundred fishermen operated between Beaver Bay and the Pigeon River. But the 1930s were a different story. The lake’s catch dwindled to below 8 million pounds. The industry never quite recovered. Predatory lamprey eels and over-harvesting nearly wiped out the trout in the 1950s. Today the Lake Superior fishing industry is all but a memory; the annual harvest is less than two thousand pounds. In 1940 the Sivertsons purchased the Hogstad Fisheries, which had purchased A. Booth in 1928. In the 1960s it began operating as the Lake Superior Fish Company, which it had acquired with its purchase of Goldish Fisheries. The company still operates today, and two of Sivertson’s grandchildren and their families remain involved. A. Kemp Fisheries, established in Duluth in 1930 by Aron and Abe Kemp, still operates. In the 1970s the company became Louis Kemp’s, named for its owner (a childhood friend of Bob Dylan, who also managed Dylan’s 1976 “Rolling Thunder” tour), who developed a process for making surimi, artificial crab meat made of pollock and whitefish. Today, Louis Kemp’s is a subsidiary of Trident Seafoods Corporation of Seattle, selling its Crab Delight throughout the world.